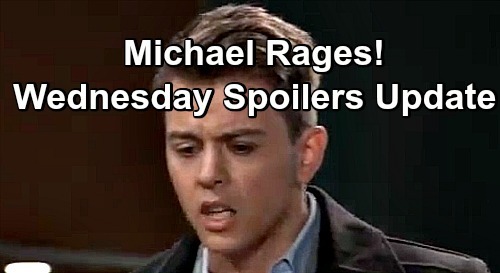 General Hospital (GH) spoilers for Wednesday, December 5, tease that Oscar (Garren Stitt) still won’t have much hope. He’s going through with the clinical trial for Josslyn’s (Eden McCoy) sake, but he just doesn’t have a ton of faith in it. Oscar will remain glum as Josslyn supports him at GH. She’ll want to talk about their future together, but Oscar will think they’d better hold off on that. Elsewhere, Drew (Billy Miller) will battle concerns as well. He’ll be glad to have Kim (Tamara Braun) by his side as they cling to Oscar’s chance of survival. These parents are still worried, but at least Oscar’s giving himself a shot. At Charlie’s Pub, Julian (William deVry) will smash a bottle of alcohol as he rages over Kiki’s (Hayley Erin) murder. He’ll be surprised when Alexis (Nancy Lee Grahn) enters at that very moment. She’ll do whatever she can to console Julian and help him find a way to cope. This is definitely a rough time for the Jerome family. Julian just won’t think it’s fair that Kiki’s life was snuffed out. He’ll hate that Ava’s (Maura West) facing this loss, but there’s really nothing he can do for her. Ava only seems interested in “Kevin” aka Ryan’s (Jon Lindstrom) support right now, which clearly isn’t what she needs! At the PCPD, Michael (Chad Duell) will burst in looking for updates. He’ll confront Chase (Josh Swickard) about Kiki’s case and insist that he wants some answers. Unfortunately, Chase and Jordan (Briana Nicole Henry) don’t have a ton to go on yet. They realize Mary Pat’s (Patricia Bethune) murder could be connected to Kiki’s, but that’s about all they’ve uncovered. Meanwhile, Valentin (James Patrick Stuart) will be nothing but sweet and loyal. He’ll let Nina (Michelle Stafford) know that Wyndemere will always be her home. Valentin was more than willing to host Nina and Sasha (Sofia Mattsson) after Kiki’s murder. He’d love to have Nina back on a permanent basis, but he won’t push too hard. Valentin will just make it clear that Nina’s got a forever invite. Other General Hospital spoilers say Cameron (William Lipton) and Franco (Roger Howarth) will dig deep. They’ll have a heartfelt discussion about their family, so let’s hope things are shifting. Cam has shut Franco out in the past, but maybe Oscar’s ordeal is affecting him just a tad. Aiden (Jason David) will also appear in Wednesday’s episode. He’ll be quiet as usual during a chat with Laura (Genie Francis), but she’ll try to coax some info out of him. Laura won’t want Aiden to be afraid of opening up. Will he admit that Charlotte (Scarlett Fernandez) is bullying him? Whatever Laura learns will give her a fresh take on the situation, so stay tuned. Finally, Willow (Katelyn MacMullen) will bump into Lulu (Emme Rylan). She may face questions about Charlotte’s school issues as well as handsome Detective Chase. Lulu is hoping to make a love connection here, but Michael may be the one capturing Willow’s heart. General Hospital spoilers say there’s a point to this dating game, so be prepared for some surprises. We’ll keep you posted as other GH news comes in. Stick with the ABC soap and don’t forget to check CDL often for the latest General Hospital spoilers, updates and news.